John Abulujo (Nigeria) travelled with CC to Carnival 2013 and stated, “It was a fun, organized trip. This was my first time indulging in the Carnival and first time playing mas. Because of CC’s strong attention to detail, I can safely say this is an experience I’d like to repeat soon”. Chanel Cox (USA) shared, “I’ve travelled to T&T before but this was a very pleasant change; there were no issues with my costume and the Tobago trip was amazing. The experience was so easy flowing and the service was friendly and professional. I’d definitely use them again”. 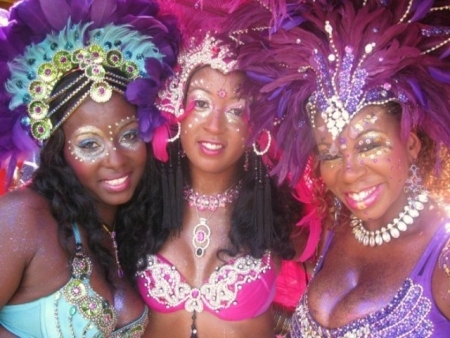 In addition to procuring Carnival essentials (hotel accommodations, transportation, party tickets and costumes) for their tour group, the CC ladies are committed from the initial stages of the booking process and devote the necessary time to efficiently explain the service to potential clients as well as to understand their needs and build their trust. They also demonstrate their dedication and loyalty by the provision of follow-up consultations to properly educate and prepare clients on all aspects of Carnival. Detailed discussions on: the proper footwear for playing mas, fete attire and safety are all given much attention. Smith and Williams have even gone as far as to adjust costumes for their clients to ensure maximum comfort. “We care about our clients; and the only way to prove this is to show them. Exceed all expectation and deliver”.